Final Fantasy XII’s gorgeous locales are filled with vast deserts that host blinding sandstorms. Its jungles are shrouded in mist and mystery. The game’s ruins are beautiful even when the undead rise from the trap-laden ground. Then there’s that damned family hanging out in the aerodomes. They can die by firaga. After letting Final Fantasy XII: The Zodiac Age consume most of my summer (and it continues to do so), I’ve come to marvel at how diverse its world of Ivalice is. It’s a strange game. I remember loving it when it was first released and I’m pleased that almost 11 years later, I’m also one of those people who’s absolutely adoring and appreciating it even more this time around. It may be strange but in the best way. 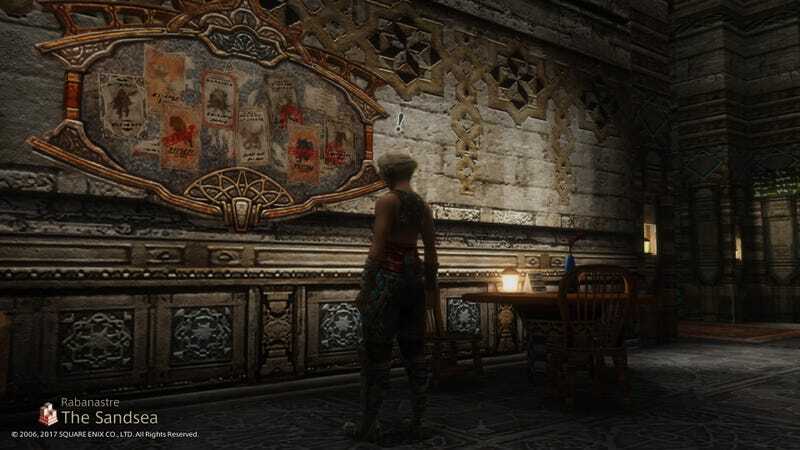 What makes Final Fantasy XII and Ivalice such a diverse, excellent and believable world can be attributed in part to its residents’ intriguing lives just waiting for Captain Basch fon Ronseburg of Dalmasca and his crew to uncover. Sometimes, all it takes is just pushing a button to talk to NPCs when the visual and auditory prompt surfaces. Without them, Final Fantasy XII would impress solely on its gorgeously detailed locations. In these conversations are reactions to all of Ivalice’s unfolding plot details as the game progresses. They’re filled with stories about how great NPCs think their cities are, how woeful their lives are, or how rotten the Empire—one of the game’s major antagonists—can be. They speak freely even when oppressed, with fierce convictions, anger, or aloofness. Each riddled with personality and interesting dialogues. Some are just stuck in their own little personal headspaces and towns, living life as they want. The inhabitants of the twelfth mainline Final Fantasy are tied to their various races and class systems. And it’s the game’s sidequests, particularly the Hunts, that can reveal how deeply tied to their communities, history, and social standings they really are. It’s thanks to the quest hunt “Visitor on Deck” that I came to better understand just how elaborate, detailed and fascinating Ivalice truly is. The hunt also made me realize just how irrationally angry Final Fantasy XII could make me. As with any hunt in the game, there’s a high chance that there’s either more to the story and some vein of truth to it. The stories built around the hunts are mini mysteries. Some lead to other quests, others tell of tragedies past, or give new life affirmations to those involved. Others feature ghosts seeking vengeance or eternal rest. There’s even a case or two involving messed up stories about over-sized pets. These intricate tales weaved into these hunts are worth seeking out because they add to Ivalice’s lore thereby making the world and its NPCs incredibly storied. The hunts themselves can be pretty fun and challenging which is an added bonus. In this particular instance, the tale tied to the hunt and mark in question, Deathgaze, is a chilling one. Or it would be if the family involved wasn’t so damned disagreeable and smack-worthy. “Visitor on Deck” begins as most hunts do—with a bill posted to a town’s message board seeking hunters to destroy ferocious monsters terrorizing a place and disrupting travel. In this case, the bill is posted by a child who swears he’s seen a wyrm menacing the sky on his airship travels but his mother doesn’t believe him. Little did I know that “more to the story” meant a family bet at my expense, a tall tale and insufferable exchanges in conversation. That seems a fair trade...no, hold on. An airship! But I’m the aspiring pirate! ME! oh heeeey, maybe deep pockets here will buy me an airship powered by chocobos! This could work in my favor. 3400 measly gil when these two get an airship and 100 sweet, feathery rides they don’t even know what to do with (the two elixirs are pretty sweet, admittedly). To borrow some words from a friend of mine: It’s sick and wrong! You know what I hope for, kid? I hope a Deathgaze tears the wing off your airship, Twilight Zone style. How do you fancy that? Look, I know Final Fantasy XII’s world has an elitist, social class problem. This family isn’t the only rude one I’ve met in my 60+ hours with the game thus far. The privileged folks make up one part of an in-depth world brimming with excellent stories, lore, and conflict. Rich, poor, Humes, Moogles, Viera, Bangaa or Seeq...no matter the race in Final Fantasy XII, they all have some jerks among the nicer folks. This is what makes the game so alive and brilliantly crafted. Final Fantasy XII’s not the first game to highlight snotty nobles or agitating characters who just get the blood boiling (not even the first to rile me up this year thanks to you, Breath of the Wild’s Hagie), and it won’t be the last. Such is life in so many video games and in...life. Such is life, too. But I think I really deserve 100 black chocobos for my troubles. Is that so much to ask? Look at all these rat bastards. And that one mole.